Billed in Variety as "The Casual Comedian", television and radio scriptwriter. Born in Aldershot. Originally worked semi-professional in showbusiness as "The Boy Baritone". Volunteered for the R.A.F. in 1939, de-mobbed in 1946, serving in England, Ireland and Canada. During this period, he honed his entertainment skills in service shows. On de-mob he formed close harmony trio "The Martin Brothers" with his brother Bill (who also became a Water Rat) and brother-in-law Bob McGowan. Toured Scotland and Germany before George broke his leg and the act split up. George auditioned as a solo comic at The Windmill and consequently stayed there for nearly two years clocking up 2,280 performances. In 1952, he signed to the Grade Organization and commenced a career playing the Number One variety theatres and prestigious venues such as the Palladium. He became a regular on television and radio, including his own T.V. series "The George Martin Show". His laid back style was very much his own, appearing in shirt sleeves with pipe in hand as he told topical gags inspired by the daily newspaper. He was also an accomplished piano and accordion player. In panto he was renowned as one of the best Buttons in the business, writing many original songs including "The Small Shepherd Boy" for The Beverley Sisters. His advertising magazine T.V. 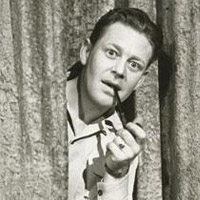 show "By George" (circa 1960) was targeted by the government as "undesirable blatant advertising" and the disillusioned George took a pub and considered leaving the profession. However, he was soon lured back and became a prolific scriptwriter for many top names of the day, including Dave Allen, Rolf Harris and Water Rats Tommy Cooper and Jimmy Tarbuck. He was the writer and production associate of PKR David Nixon's television magic shows for many years. Also, he was the sole writer of scripts, songs, parodies and stories (plus a record album) for "The Basil Brush Show" for 13 years. In between his many writing assignments, he still worked as a performer, becoming particularly renowned as a witty and urbane after dinner speaker. His talents took him worldwide to places such as South Africa and the Far East. He was initiated into the GOWR in 1960 and became 1971's King Rat. In addition, as well as serving as Preceptor, he was awarded virtually every honour the Order could bestow including Rat of the Year (1967) and the Badge of Merit for his charity work. Married first to Joan Hewitt (3 children: Sue, Mike and Ray - Mike and Ray both became Water Rats... Mike in 1994 and Ray in 2012), then to Margaret Mitchell, a soprano from the D'Oyly Carte Opera Company. His signature tune was "Spread a Little Happiness".